SKS Bottle offers PCR plastic containers (Post Consumer Resin) as a sustainable solution for environmentally friendly packaging. PCR plastic consists of a blend of recycled resins that would have otherwise ended up in landfills and replaces the use of virgin polypropylene resins. With the ability to recycle into beneficial new packaging, PCR plastic is comparable to the appearance and higher-end feel of PET plastic while providing consumers with eco-friendly satisfaction in your product. The PCR plastic containers (pictured below) are comparable in appearance and durability to PET plastic containers. Pricing: Please contact us for pricing information. Helps avoid the further depletion of fossil fuels. Can be made out of 100% post-consumer content. PCR plastic offers resistance to stress cracking. Maintains a low gas-vapor transmission rate. PCR plastic offers similar durability and appearance of PET plastic. Less energy and water is required to produce PCR plastic than other plastic types. The production of PCR plastic begins with the collection and sorting of recycled products in commercial and residential recycling programs (i.e. paper, plastic, metal, cardboard and aluminum cans). The contents are then separated, washing and removing away the scrap materials. The recyclable plastic is then extruded & reprocessed into post-consumer resin. 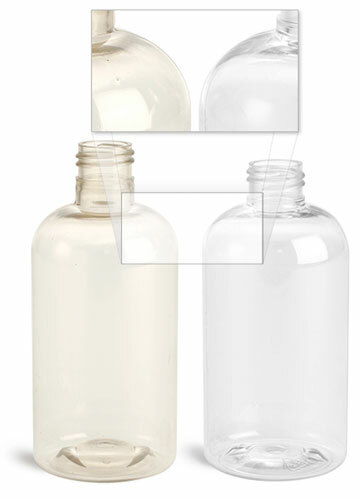 PCR plastic can be used in the manufacture of new PET plastic containers and packaging, including the creation of PCR plastic bottles, jars, caps and closures. PCR plastic can be produced in a variety of recycled content percentages up to 100%. PCR plastic containers are used often in the Cosmetic and Bath & Body industries to package ecologically conscious products.